Ady’s Racers is about more than flying around a track in a high speed stock car. It’s about building community, one family at a time, in a stress and judgement-free zone. Ady’s Racers is a day designed especially for autistic children and their families. It’s an event where siblings and loved ones can get away, ride in a professional race car, climb in inflatable obstacle courses, enjoy great food, and listen to music- a place where families and their kids can finally just be themselves. But Ady’s Racers can not happen with out you! Both a fundraising effort and day of celebration, our goal for Ady’s Racers is for you to be a part of creating lasting memories and friendship for our Ady’s Army families. The even begins with a ride in a professional stock car, which serves as a means of fundraising for the event. Anyone interested in contributing can buy their very own spot (with an up to 20 character message) on the car. Businesses can even put their logo on the actual truck. When the entire car is covered, the event can start its engines. So join us at the start line to give kids and their families a green light on the day of a lifetime together! 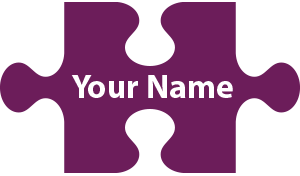 Individual sponsors will be recognized on a puzzle piece. Corporate sponsors on a checkered flag. After purchasing your spot, click on the link in your receipt email to provide the details of what you would like to be displayed on the car hauler. We couldn't do this without our sponsors!